Implants that could feel like your real teeth! For many years, the only treatment options available for people with missing teeth were bridges and dentures. But, today, dental implants are available. They look and feel like your own teeth and they don’t require altering other teeth like a bridge does. Implants are very durable and with good oral hygiene and regular checkups by your dentist, the success rate can be up to 98%. 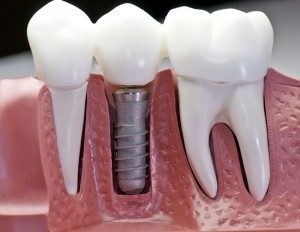 Implants can be used to replace single or multiple missing teeth as well as to secure a removable prosthesis such as a denture.